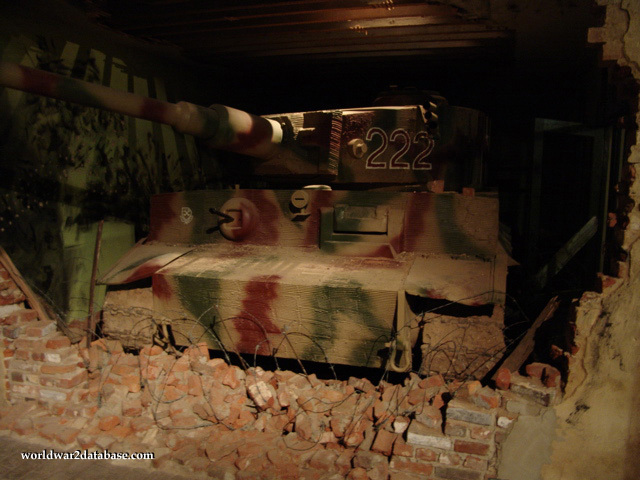 The Tiger I was so heavily armored that the Western Allies either countered it with an air or artillery strike or lost dozens of vehicles stopping these monsters. This is actually a mockup of a Tiger I, the T-34 treads give it away. This particular vehicle was used in Saving Private Ryan. It's painted as Tiger 222 of Schwere SS-Panzer-Abteilung 101, commanded by Kurt Sowa, and the command tank of Michael Wittmann during the Battle of Villers-Bocage. Whitmann started out with six Tigers but mud, breakdowns, and circumstances led Whitmann and Sowa to drive this tank alone into the village, destroying over 30 British armored vehicles, including 8 Cromwells and 4 Sherman Fireflies. An anti-tank gun damaged his tread, and Whitmann and his crew abandoned the tank and escaped in the confusion. Credited by OKH with 27 tanks singlehandedly, Whitmann was awarded the Kinght's Cross with Oak Leaves by Hitler on June 25 and annointed a hero of Germany, Whitmann was killed in July when he returned to the front.